Hero MotoCorp will launch a 200cc faired motorcycle in 2019. Although little was offered in terms of details, we expect the bike to use the Xtreme 200R’s engine and underpinnings. And while the Xtreme 200R’s diamond type frame suspended on 37mm front telescopic forks and preload adjustable rear monoshock is likely to feature on the new bike, the engine might see a minor bump in power. In the Xtreme 200R, the 200cc single-cylinder, air-cooled motor produces 18.4PS of power and 17.1Nm of torque. The new faired bike is likely to get a more powerful fuel-injected variant of the Xtreme 200R’s engine, a 276mm front disc, a 220mm rear disc, single-channel ABS, 100/80-R17 front and 130/70-R17 rear tyres. It might also get a fully-digital instrument console, clip-on handlebars and LED headlamps to bolster its sporty credentials. Hero Karizma ZMR prices start at Rs. 1.11 lakh (Ex-Showroom). 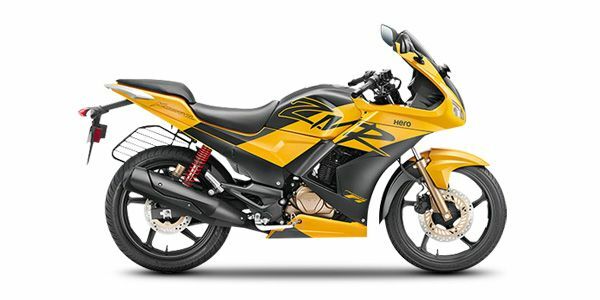 Hero Karizma ZMR is available in 1 variants and 3 colours. Share your experiences with Karizma ZMR? The claimed ARAI mileage for the Hero Karizma ZMR petrol is 51 kmpl. Q. Can this bike compete with hero karizma R? Awesome bike. it is very reliable for long journey. Current model is too much harashing ...dont go for it..
Q. Hero ZMR or Pulsar 220F, which is best? Q. Is ZMR available in showroom? Q. When will it come with ABS? Its good and very much comfortable to handle and ride .. Confused about Hero Moto Corp Karizma ZMR?